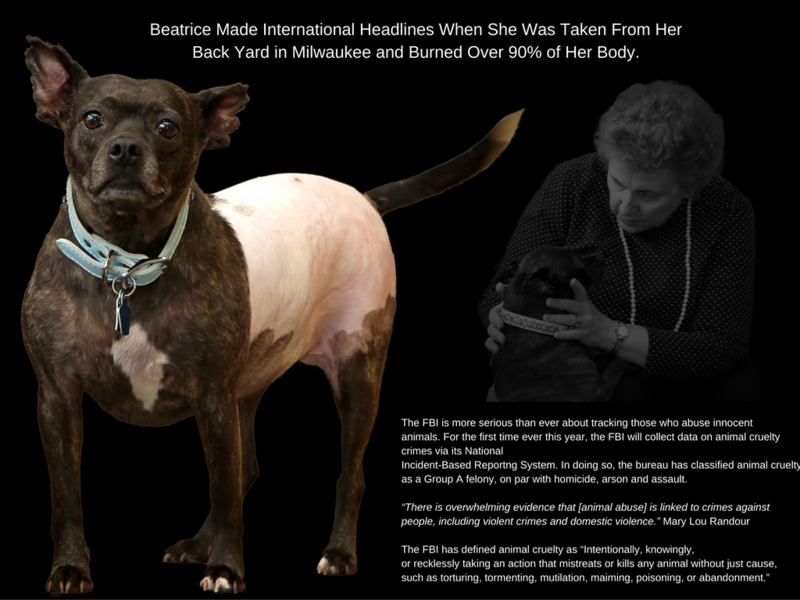 Animal Fairy Charities offers a new program inspired by Beatrice, the badly burned dog from Milwaukee. Animal Fairy Charities is now offering new programs for both kids and adults in an effort to help prevent animal abuse. With so many animal charities focused on the welfare of animals, AFC aims to target the emotional intelligence in both children and adults. By teaching adults how to nurture the emotional IQ in children, preventing animal cruelty could become a thing of the past. It is well documented that children learn empathy from others. Possessing Empathy is key to being kind and caring. Recently, scientific research has offered strong evidence that there is a link between animal abuse and violence towards human beings. In many cases children and young adults are the offenders of this animal cruelty. Some of these offenders go on to commit domestic violence and even become serial killers. The question is, can we stop the violence before it starts? A5 (Alerting Adults About Animal Abuse) is an educational program to teach children and adults, how to spot, report, and how to do their part to help end animal abuse. The mission of A5 will focus on helping to end animal abuse and the dangerous cycle of violence it creates. According to the National PTA Congress, “Children trained to extend justice, kindness, and mercy to animals become more just, kind and considerate in their relations to each other. Character training along these lines will result in men and women of broader sympathies; more humane, more law abiding, in every respect more valuable citizens.” Classes will educate children on compassion and empathy for animals by emphasizing the importance of safely reporting animal cruelty, neglect and abuse to trusted adults. Circumstances of abuse vary vastly, therefore children will be taught how they can help in a wide array of situations. Through hands-on activities: reading books about animals, modeling with toys, and playing interactive games, children will learn how to properly engage with animals, and, in turn, all living things. By encouraging interaction with live animals, respect and responsibility become instilled at a young age. In seminars for adults (parents, guardians and soon-to-be parents), a licensed therapist will explain emotional intelligence and its role in animal abuse, child abuse, and domestic violence. Emotional intelligence, by definition, is a person’s ability to identify, evaluate, control and express emotions. It helps us communicate with others, negotiate situations and develop clear thought patterns. By learning how to build and maintain secure attachments with your child and positively dealing with defiance through clearly set limits, caregivers will promote a healthy emotional intelligence that will allow children to better manage fears and anxiety. Sign up to be the first to receive A5 news, A5 alerts, A5 Kids and Adult class registration, seminar dates and more!